The Government has commissioned a £500m study into technology that could allow electric vehicle owners to charge their vehicle as they drive. The study is being conducted with BMW and Renault and could result in wireless charging panels being embedded beneath the surface of public motorways, which will then charge electric vehicles as they drive over the surface of the road. The announcement is the results of a two-year Government feasibility study to look at various ways of reducing the range anxiety that prevents many from buying pure EVs. 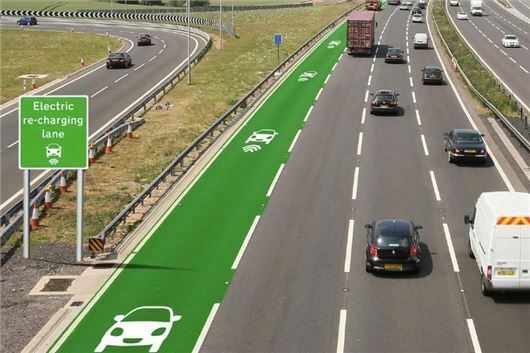 The study focused on the possibility of installing a Dynamic Wireless Power Transfer (DWPT) system beneath the UK’s major motorways. The system will use a number of coils embedded in the road to charge EV battery wirelessly, via power units deployed on the verge behind motorway crash barriers. The study used the M6 as an example to look at installation feasibility and it is estimated that a one mile stretched would cost up to £425,000 to convert for wireless charging. Although the report estimates that the new road system would result in a 45 per cent reduction in CO2 and 30 per cent NOx emissions, the consequent loss of VAT and fuel tax revenue would run into the millions - around £14 million per mile over a 20-year period. Another problem would be the development of universal in-car technology, which would have to be agreed by car manufacturers. The system would also have to be retrofitted to existing electric vehicles. However, despite the clear obstacles, the off-road trials have been given the go-ahead to begin later this year, lasting around 18 months, with the Government stating that it “could” lead to road trials. If successful, it’s believed that wireless on-the-go charging could be a motorway reality within 10 years.